With Rohitab API Monitor it is possible to set up API filters based on function names or libraries and capture each call to them. You can also set breakpoints before or after a call and under error or exception conditions. To show part of its power, let's see how to monitor a simple program that shows a message box. So just like with any debugger, you can actually make changes on the execution flow of a program but it can be a way more easier with API Monitor, depending on your needs. One nice feature is to support external DLLs so if your target use a custom library, you can also intercept these calls and see what is going on. Some programs create files on the system and then deletes or changes it. Of course you can use any debugger to stop where you want, or even the previously shown API Monitor for that, but there is also another way of doing it with FileGrab tool. This tool capture newly created files on the system and copy them to a directory or upload them to a FTP server. 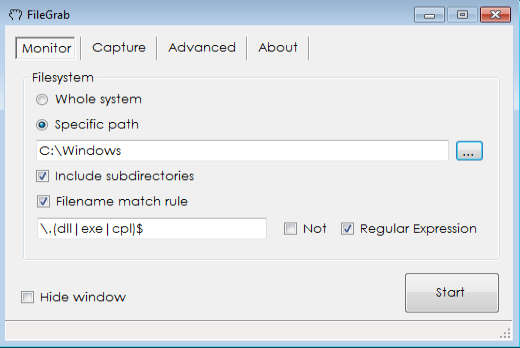 You can use either regular expressions or MS-DOS wildcard matching. One of ACCDFISA ransomware families used to create an encryption key in the disk and then secure delete it. I could easily verify this using a *.dll filter with FileGrab.